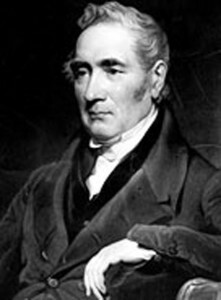 Stephenson was born on June 9, 1781, in Wylam, England. He followed his father into the coal­ mining industry, and by age 19, with no formal schooling, he had operated Newcomen steam engines (named after THOMAS NEWCOMEN) in several mines around Newcastle. Attending night classes, he learned to read and write, and he learned mathematics by going over homework with his son Robert. By 1812, as chief engine mechanic at Killingworth coal mine, Stephenson had built 39 stationary steam engines and several wagons that ran on rails and were drawn by steam engines. In 1813 Stephenson observed a “steam boiler on wheels,” a wagon with a built­in steam engine, designed by John Blenkinsop and utilized at a neighboring mine. The vehicle had cogwheels that fit into a third cogged rail, which made the system more expensive and complicated than one utilizing smooth rails. Several versions of steam locomotives that ran on smooth cast­ iron rails had been built by other engineers, but the rails would break under the weight of the engines. Stephenson decided to try his hand at improving existing steam locomotives. His first design, the Blucher, had flanged wheels, which have special rims to guide them along the rails. The Blucher weighed less than four tons and could pull 30 tons, a load capacity greater than previous models, and furthermore, the rails did not break under the relatively lightweight engine. The locomotive began hauling coal at Killingworth in 1814. Stephenson later introduced the “steam blast,” which directed steam up the engine’s chimney, pulling air upward, creating greater draft, and thus increasing the engines efficiency. He built several steam locomotives for coal mines over the next few years. In 1825 engineers completed the Stockton­ to­ Darlington railroad on which Stephenson’s Locomotion, the first passenger train, carried 450 people the 18­kilometer distance at 24 kilometers per hour. In 1829 Stephenson built a 64­kilometer railroad from Liverpool to Manchester, and eight locomotives, built at his newly established Newcastle Locomotive Works, ran on it. Stephenson died on August 12, 1848, in Chesterfield, England. Stephenson’s innovative accomplishments in steam locomotion set the stage for the rapid evolution of this new mode of transportation. Steam locomotives were the first land transportation faster than a horse ­drawn buggy, and they changed people’s lives drastically. Once their safety had been established, they spread around Europe and North America, linking distant cities and enabling people to travel farther faster. Railroad development almost everywhere followed the practices instituted at Stephenson’s Liverpool and Manchester Railway, which had two tracks, one for eastbound traffic and one for west­bound traffic. There were railway stations along the lines for the convenience of passengers, who could travel first, second, or third class, and were charged a certain amount per mile. Locomotives ran on a strict timetable, forcing the synchronization of local time from place to place. Stephenson’s son, Robert, was educated as an engineer and joined his father at the Newcastle Locomotive Works. Better trained than his father, Robert Stephenson systematically improved the steam locomotives components; his efforts paid off in 1831 with the superb model called Planet, which became the prototype for most subsequent designs. The next step in locomotive development was marked by the advent of compressed air brakes, invented by George Westinghouse in 1869. Previous brakes consisted of hand­ operated shaft systems. Westinghouse’s brakes represented the first fully mechanical braking system and thus ensured the safety of railway transportation. Locomotives changed little until electric trains appeared in the twentieth century. Diesel­ electric trains (using the engine invented by RUDOLF DIESEL) began to be used in the United States in 1935 for passenger trains. Requiting less fuel and less service, diesel­ powered freight trains became the norm after World War II. Posted on March 10, 2015 by Natalie. This entry was posted in Inventors. Bookmark the permalink.